In a bizarre misuse of resources, Hearst's New York American gives out free embossed postcards featuring some of their headlining cartoonists. But does the company have the cartoonists themselves draw their characters, or repurpose a panel from one of their strips? Nope. 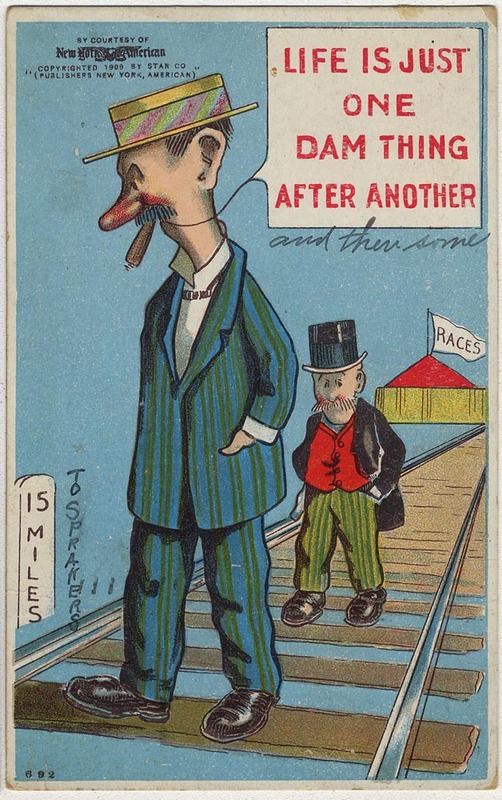 In 1909, when Bud Fisher had just arrived in New York City to continue taking the comic strip world by storm, they instead had some anonymous hack draw Mutt and Jeff, and a pretty awful job it was, too. I am sending you a magazine that tells the story of some of the moving pictures. You can tell some of the people in them, for although they may not be the same plays, some of the people were in the picture that you saw. J.M.S. It sounds to me like Aunt Camelia has just seen her first film, and she is intrigued. Interestingly, in these days before there really were true 'movie stars', she seems to have expressed an interest in knowing more about specific actors. A pioneer film fanatic! In the early days of film, audiences only gradually became interested in the performers themselves in the flashing shadows. In the beginning, the studio's identity came first, so if the anonymous actors were related to at all, it was with monickers like "The Edison players" "The Selig Kid" or "The Biograph Girl" (that was how Mary Pickford was originally known.) Long forgotten cinemactress Florence Lawrence was the first named star in 1908. The Mutt & Jeff card was not one of the Hearst freebies, it was in fact a licenced item, the fee going to early marketing wizard Bud Fisher. The NY American/Star Co. imprint is some sort of legal obligation. Mark: the hack art doesn't make sense to me even more so if this was something Bud Fisher himself stood to profit from. Why would he not take 20 minutes to draw his characters (or even just repurpose some existing art), and guarantee better sales for the card? Fisher would just licence to anyone who could pay for it, in this case a post card publisher. He was not one to insist on perfection, licensing hardly ever does, especially not a hundred years ago. I was in licensing for a long time, and it operates thusly; A licensor can do new art for the licencee, or offer ready made "Style Guide" material, or can insist on final approval of what the licencee has created himself, but in the end, the licencee will choose for himself and the licencor just sits back and collects his fee. The quality of the art can be bad, but if you look on the above mentioned blog site, you'll see some of the Hearst-created cards that were hacked out by some appalling incompetants that hardly made the product look good. as for Fisher, you'll note that a lot of his licencing art as well as his strips were done by others. The often seen portraits of M&J that were used for the stage shows were apparently drawn by C.W. Kahles when he did a series of ads for "Mutt & Jeff In College" (1915), and one thing that Fisher was famous for was never touching a pen again when he made enough to hire his own hacks.